Victor Rios grew up in the ghetto of Oakland, California, in the 1980s and 90s. A former gang member and juvenile delinquent, Rios managed to escape the bleak outcome of many of his friends and earned a PhD at Berkeley and returned to his hometown to study how inner-city young Latino and African American boys develop their sense of self in the midst of crime and intense policing. 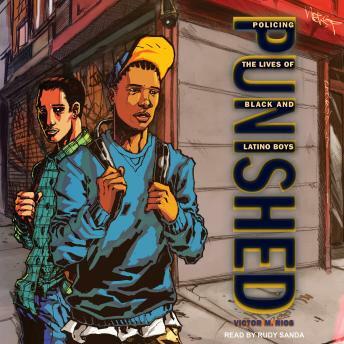 Punished examines the difficult lives of these young men, who now face punitive policies in their schools, communities, and a world where they are constantly policed and stigmatized. Rios followed a group of forty delinquent black and Latino boys for three years. These boys found themselves in a vicious cycle, caught in a spiral of punishment and incarceration as they were harassed, profiled, watched, and disciplined at young ages, even before they had committed any crimes, eventually leading many of them to fulfill the destiny expected of them. But beyond a fatalistic account of these marginalized young men, Rios finds that the very system that criminalizes them and limits their opportunities, sparks resistance and a raised consciousness that motivates some to transform their lives and become productive citizens.